"A real Men's shop, gifts Men actually want." Huge Selection of Vintage Watches curated for all budgets| Rare and Desired Pocket Watches |Railroad Watches |T-Shirts|Damascus Steel|Rare World Coins|Cufflinks|Antiques... and more! Use the Menu System to find a lot more goodies! We understand that privacy is very important. We do not sell any information or release any information about you or a watch you purchase unless you've written a testimonial and agree to allow us to use it. If you are a celebrity, politician or well known individual, you have our utmost promise of complete privacy; we will not use your name to advance our business nor will we disclose your name or information as a client. Please note, as part of our fraud protection protocols, all orders will be verified through an address, name and phone background check to ensure we are shipping your purchase to you and protecting both parties from credit card fraud. Please note international transactions require identity verification prior to dispatch. Subscribe to our vintage watch newsletter and be in the know. The watch movement, also known as a caliber, is the engine that makes your vintage watch "tick". Actually, unlike a quartz or battery operated watch, a vintage mechanical watch doesn't tick just once per second. When you wind a mechanical watch, you compress a mainspring usually located underneath the bridge(s) of the movement, creating stored energy. In a controlled way, the mainspring slowly releases this energy and makes several important gears turn in a symphony designed to tell the user the time and cause a sweeping seconds hand effect; if there there is a seconds hand. The beauty of a vintage mechanical watch is not just what you see on your wrist; it's also in the movement. The example above is a Hamilton cal 747. The 747 is expertly decorated in Cotes de Geneve and was assembled, machined and decorated by hand by a master watchmaker in the Lancaster, PA Hamilton factory over 60 years ago. Today, these movements are the last survivors of what was once a thriving US industry; one that easily rivaled the Swiss. These movements were made to survive generations when properly cared for. The fact that you can purchase these watches in today's market at prices well below fine modern mechanical watches is truly amazing. 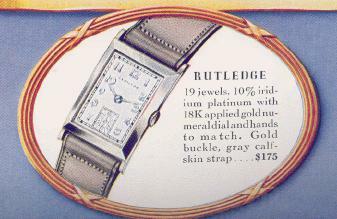 If your a man of distinct character, you will surely appreciate a fine mechanism of historic value on your wrist; the idea of batteries in watches will be nothing but a distant memory.